WHO WILL BE DRIVING THE 22 AT HOMESTEAD, FL? His total will be 2300. I have a little faith that he'll do better. You can.....but I am from FL also, so I am used to hanging chads, and such.......so it is my right to vote, after the race ended!!!! I see that the "ladies" were having a lot of fun at my expense! Revenge is indeed sweet!!! 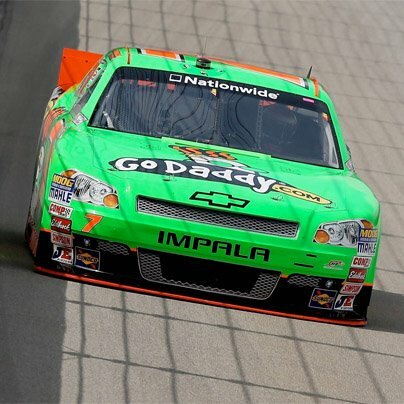 Danica Patrick crashed Tony Stewart’s No. 14 Chevrolet Monday at Michigan International Speedway during a test session. Patrick was not injured. DAYTONA BEACH, Fla. -- NASCAR announced that all equipment manufacturers have met the necessary targets for the 2013 Sprint Cup Series race car, based upon the final aerodynamic test results from July 18, and can begin making parts and pieces for the new models. The new Cup car is the result of more than two years of collaboration between the manufacturers and NASCAR. The new cars more closely resemble models on the showroom floor, and their rollout is highly anticipated by fans. The four new models -- Chevrolet's SS, Dodge's Charger, Ford's Fusion and Toyota's Camry -- will make their race debuts during the Daytona 500 on Feb. 24, 2013 at Daytona International Speedway. "We commend the manufacturers and our team at the R&D center on all the hard work they've put into this new car," said Robin Pemberton, NASCAR vice president of competition. "With all the designs and surface areas of the car now approved, manufacturers can now move forward with building the components needed to outfit their cars. The wind tunnel testing we've had with the manufacturers over the past several months has given us the timely and necessary data we needed to come to this confirmation. We believe the new car is going to be a milestone opportunity for our sport, one that our fans will embrace." The Camero is for the Nationwide Series. It joins the Mustang and the Challenger, that were introduced last year. Nascar wants the series to be different to help keep it interesting for everyone. Grill; think Matt will wear that Home Depot uniform well! Maybe not too much longer, and we'll get an announcement. GREAT JOB on the photoshop! Thanks Sea. I'm working on it. Might consider buying it after the trial. Have to see what they offer. Great article on John Townley racing in the Pocono race! 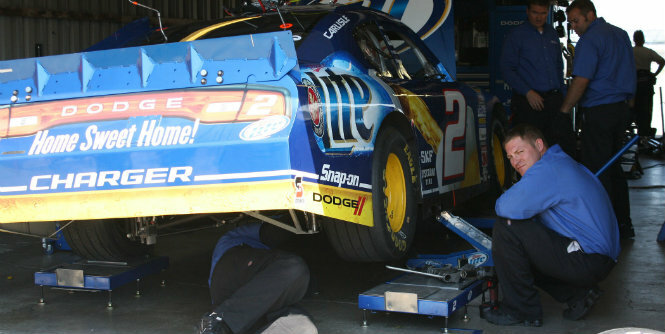 BROOKLYN, Mich. -- A tire test at Michigan International Speedway saw fast speeds and happy drivers. The day-long tire test allowed teams and Goodyear to check out the new tires the teams will race when the Sprint Cup and Camping World Truck Series return in a few weeks. Goodyear combined the original tires from the April test with a slightly softer version of the harder tire used during the June race for the 2-mile track. The last time drivers were at MIS, the tires were very hard, a last-minute change made when some drivers experienced blistering on their tires during practice sessions. To avoid bringing back the same tires, Goodyear developed the new combination. "Back in June was our first race on this new pavement. We digested everything we saw over the weekend, in practice as well as what we had in the race," said Greg Stucker, director of racing tire sales for Goodyear. "We digested that and looked at all the data, poured over all the comments we got from the teams and drivers, made our recommendation for our package coming up in August. 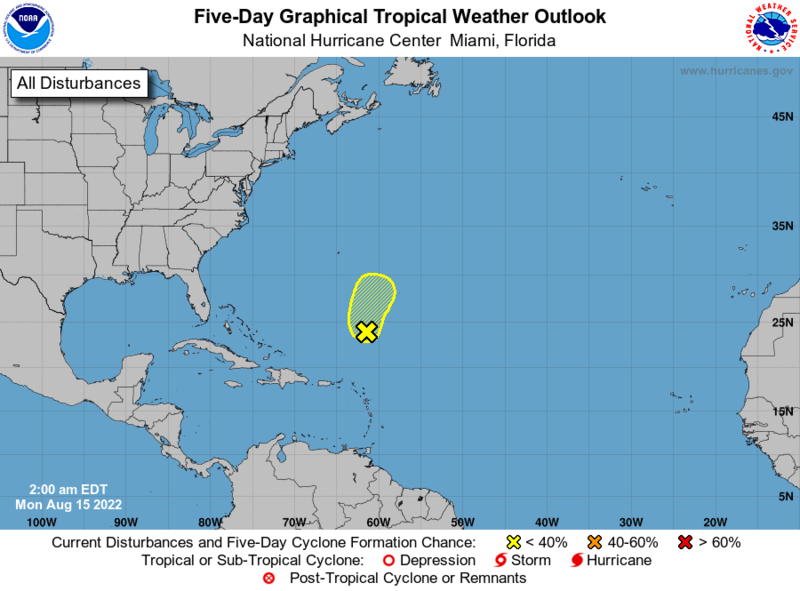 That is why we were here [Monday] for, just confirming that." Twenty-eight Cup teams and two Truck teams participated in the tire confirmation Monday. MIS became NASCAR's fastest track in June. Marcos Ambrose's speed of 203.241 mph for the Quicken Loans 400 was the 11th-fastest pole-winning speed in Cup history and the first time the pole-winning speed was faster than 200 mph at a track other than Talladega or Daytona. Though top speeds were not official, some drivers went about 210 mph on Monday. The average was about 195 mph, a little slower than during the April test and June race. Greg Biffle thought the speeds, though slower, would lend themselves to exciting racing. "Since the speed is down just a tiny bit, I think you will see that groove continue to widen out," Biffle said. I have even floored it down lower on the race track, and the car has some turn in it down there. I think we are going to see some good racing. "We were all fearful that this tire would be really low on grip and the car would be hard to drive and it would chatter out from under us. That is certainly not the case." Brad Keselowski, a Michigan native, agreed. "Michigan is a lot different track with the repave, and we saw that here with the spring race. 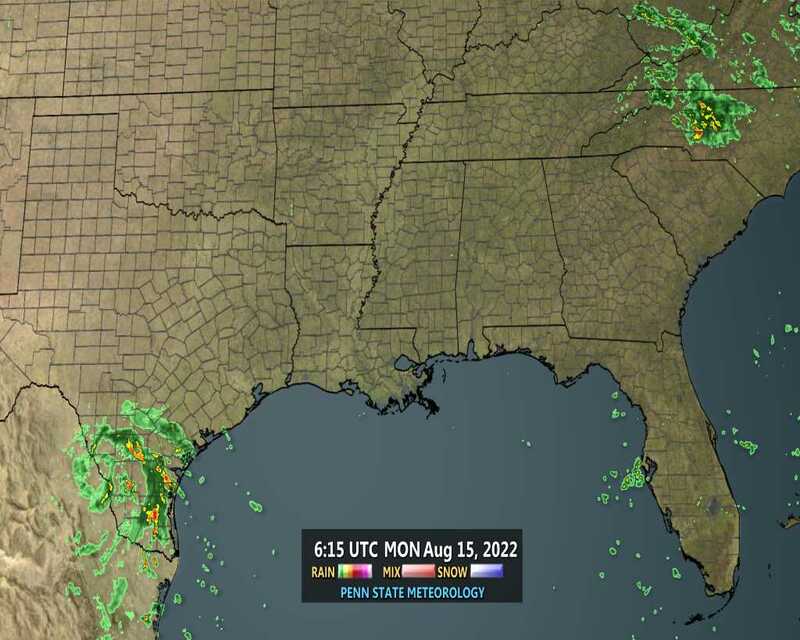 So we're all still just trying to get a grip on that, literally, and trying to figure it out," he said. "So Goodyear has us here to kind of reconfirm some things that we saw and hopefully improve the racing another notch here at Michigan International Speedway. So we're just trying to help out here as we can and also make our cars better at the same time. So it's a good process for all." Nice pic, Grill......glad you liked it enough, to post it!!!!! Was hoping that it would be of someone else, but ya can't win them all. Michael McDowell, in a vicious accident during qualifying at Texas Motor Speedway in 2008. That was one of Randy LaJoie's seats. Elliott Sadler, when he flipped most of the way through Talladega's Turn 3 in 2003. 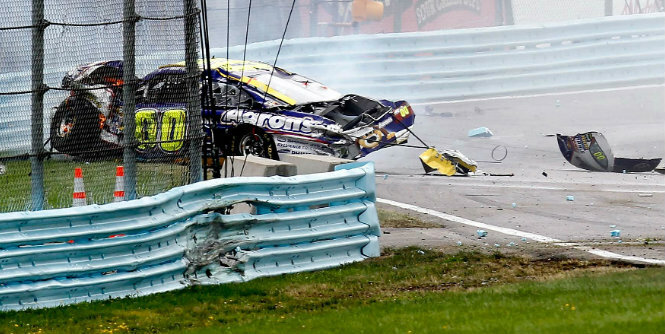 David Reutimann on the white-flag lap at Watkins Glen last year, a mishap in which he careened across the track like a sling shot. Those were LaJoie seats, too. "At the end of the day, I'm a pretty damn good race fan, and I don't want to see anybody get hurt." A two-time champion of what's now known as the Nationwide Series, LaJoie knows his stuff. The only thing missing from a piece put together by The Joie of Seating is a place for the driver's guardian angel to ride shotgun. One of LaJoie's custom-fitted cocoons is a far cry from what once was standard in the NASCAR garage. LaJoie keeps a reminder of that on a shelf in his Concord, N.C., shop. The simple bucket seat was used by the late Benny Parsons. There's really nothing to it, just some padding covered in fake leather -- or maybe it is plastic -- and the tiniest right-side rib protector. These days, it's hard to imagine that a rookie running the entry division at the lowliest of short tracks would sit in such a thing, much less a one-time Cup Series champion. Racing has come a long, long way. No racing seat, no matter how marvelously constructed it might be, ever will be completely crash-proof. That's what keeps LaJoie going year after year, doing the development and research that he does. When a driver is able to walk away from an accident like McDowell, Sadler or Reutimann did, those are LaJoie's checkered flags these days. It doesn't matter whether it's a Cup, Nationwide or Truck event or some weekly quarter-mile bullring somewhere. "Safety is a moving target, because there's never the same accident twice," LaJoie said. "Everything is always different. The ones that don't look like they're the worst, more than likely, are the worst. Maybe there [are] two impacts at the same time, a change of direction. "When I first started the company, I didn't want to get hurt. Then, I didn't want my kids to get hurt. Then, you know what? At the end of the day, I'm a pretty damn good race fan, and I don't want to see anybody get hurt." When it comes to seats, The Joie of Seating isn't the only game in town at the highest levels of NASCAR. Hendrick Motorsports has a carbon-fiber seat that its drivers, as well as others, use. There are ButlerBuilt Professional Seat Systems and Richardson Racing Products as well. For more than 30 years, though, LaJoie was his own crash-test subject. During the first race LaJoie ran in 1980, he was sitting in a custom-fitted fiberglass seat that had originally been designed by racing legend Mark Donohue. Once he started driving other people's car, being left black-and-blue from simply sitting in their rock-bottom basic seats, LaJoie became an even bigger believer in his seats. Their evolution took time. When the fiberglass cracked in a crash, he built a cage around the next seat to reinforce it. A few of the wrecks LaJoie endured were doozies, but there was one in particular that people remember. After spinning off Turn 4 in a qualifying race for the 1984 Daytona 500, LaJoie plowed headlong into a guard rail on the inside of the track. That shot him into a series of violent tumbles that left him with a concussion, but not much more. Incredibly, the seat he used that day had no padding. The piece of fiberglass had been formed to his body, so according to LaJoie, it didn't need any. Inspectors had seen the seat before the wreck and told him it looked like a bathtub. In order to compete that week, LaJoie had to sign a waiver basically stating that he was on his own if anything happened to him while using it. There was still more confirmation that he was doing the right thing four years later. Driving for veteran independent Bobby Wawak, LaJoie made the starting grid for a 1988 Cup event at Dover. He'd won there on the Busch North tour and was comfortable on the track's 1-mile high banks. He was comfortable at Dover, that is, in his seats. In Wawak's car, the seat had nothing on the left side and only a flat piece of steel on the right. He made one lap in practice, then headed back to the garage. His crew wondered why. "What's the matter?" they asked. "That's the fastest that thing's ever went." "I almost fell out of the window. I can't hold myself in this car," LaJoie said. LaJoie ended up grabbing the belt from his pants, plus another from a crew member. He wrapped them around the roll cage and his chest to secure himself snugly, if not safely, into the car for the rest of practice. "The effort you put out to hold yourself in a race car with a rib-protected seat is immense," LaJoie said. "Your upper body is so heavy. That's the biggest advantage of a containment seat, is that you work less to hold yourself in a race car." Marketed to virtually every level of stock cars and open-wheel cars, LaJoie's seats are based on the theory of containment, beginning with the shoulders and pelvis. Ribs are the approximate size of a finger and easily breakable. The shoulder and pelvis are much stronger, and they're supported in a crash by a seat like the ones built by The Joie of Seating. Two more important parts are a restraint device, such as the HANS, and a headrest that is part of the seat itself, not one that's attached to the roll cage. The roll cage can move in an accident, and if the headrest is dislodged while the rest of the seat remains in place, bad things can happen. "If you keep your head, your chest and your pelvis in line when you hit something, you're going to have a whole lot better chance of walking away," he said. Beginning in 2011, seats for NASCAR's three national touring divisions had to be certified by the SFI Foundation. That was a game changer. "The safety cells for the drivers limited their movability," LaJoie said. "Drivers do not move anymore. There's no documentation anywhere in the world that says a driver who did not move got hurt. Every time a driver gets hurt, it's because he moved. There are people in this industry today who still tell you that the driver has to move, and they're building seats for people. That's just not right." That was a great article, Grill!!! Thanks for posting it. Hey Sea...I just noticed the poll results at the top of the page.....I always go to the last unread post........So, did it automatically calculate, after a certain number of days, or what....and did it post itself, or did you have to do something???? Give me the skinny!!!!! Great story Grill! Always enjoyed Randy when he was racing. sangria wrote: Hey Sea...I just noticed the poll results at the top of the page.....I always go to the last unread post........So, did it automatically calculate, after a certain number of days, or what....and did it post itself, or did you have to do something???? Give me the skinny!!!!! Must be something it does itself; maybe an admin function for so many days? Thanks for the articles, Grill. Really good reading! San, with the poll, I think once you've voted, it gives you the results and then keeps adding as everyone else votes.